If you have any information / perspective on any of these items, please send me an email to spytools@sympatico.ca (Richard). 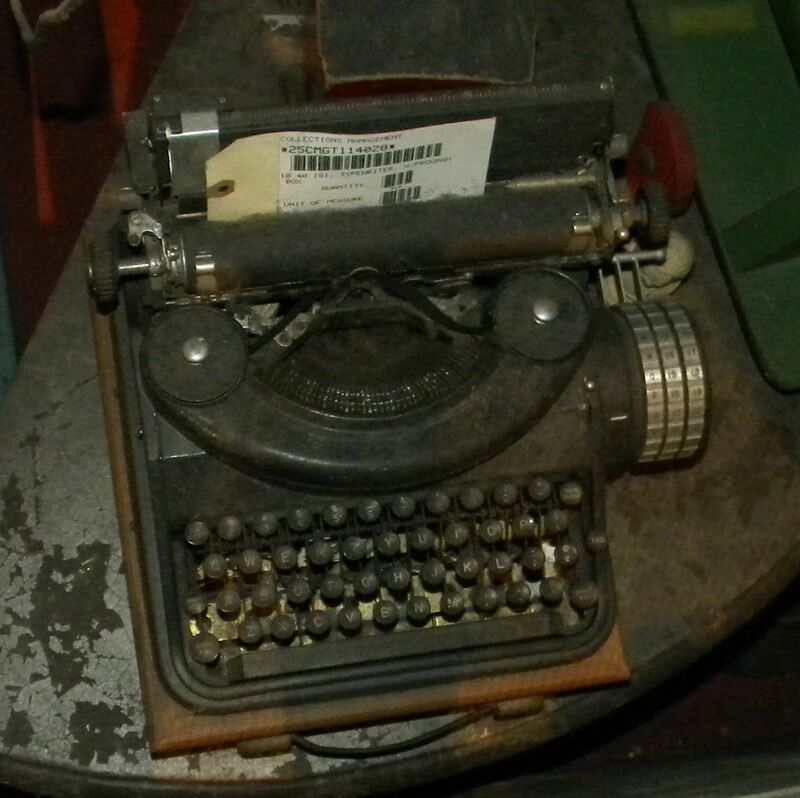 Click for larger photo Source: Personal Collection Mystery Typewriter at Disney's Hollywood Studios (backlot tour - building of movie props). Photo taken in late October 2013. I have taken many photos of this mystery typewriter during my visits at Disneyworld's Hollywood Studios in the movie prop building one goes through in the backlot tour. This typewriter has 3 knob-rotors on its righthand side. The leftmost of the rotor-knob appears to have the letters A to Z while the other two rightmost would likely have numbers 1 to 26. I strongly suspect that this is simply a typewriter prop with those 3 knob-rotors added with no functional effect whatsoever. Here is another photo taken in front of the caged display - very challenging to get the right focus! If anyone can recall what movie or show this mystery typewriter would have been in, I would much appreciate receiving that insight! Even the make/model/year would be appreciated in regards to the base typewriter. On November 4th, I was informed by Paul Robert (owner of typewritermuseum.org website) that the base typewriter is a Remington/Underwood Noiseless Portable and is not aware of the right knob/rotor attachement for this model. There is some thought that these wheels would act as combination lock wheels/tumblers likely preventing the roller from sliding out of its rest position. And thus meant to prevent use by any other than the intended user - perhaps due to its being kept in an open environment. 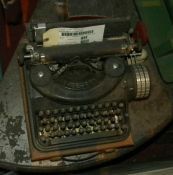 No other significant information on the web has been found on this typewriter even after getting in touch with Disney. 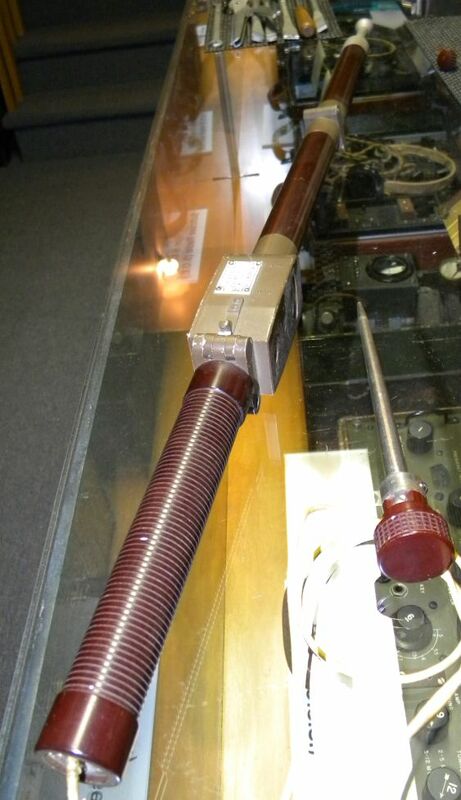 Click for larger photo Source: Personal Collection Mystery coder cylinder. Here is a piece that I picked up a few years ago in the U.S. and I have not found anyone who was at all familiar with it although I do have some plausible perspectives from Mark Blair and Robert Welsh which are included on the right. 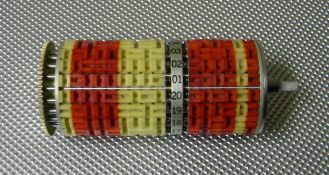 I believe it to be a simple encoder/decoder (perhaps keyer) type cylinder with 20 rows of 15 inserted pegs - the pegs have 2 bars on their edges and can be inserted vertically or horizontally which equates basically to binary code. As found, the first column of pegs are white, the next 4 are red, the next 4 are white, next the fixed row markings (1 to 20), next 4 reds, next 1 white and finally 1 red. The width of the cylinder is just over 7cms wide and just over 3cms in diameter. 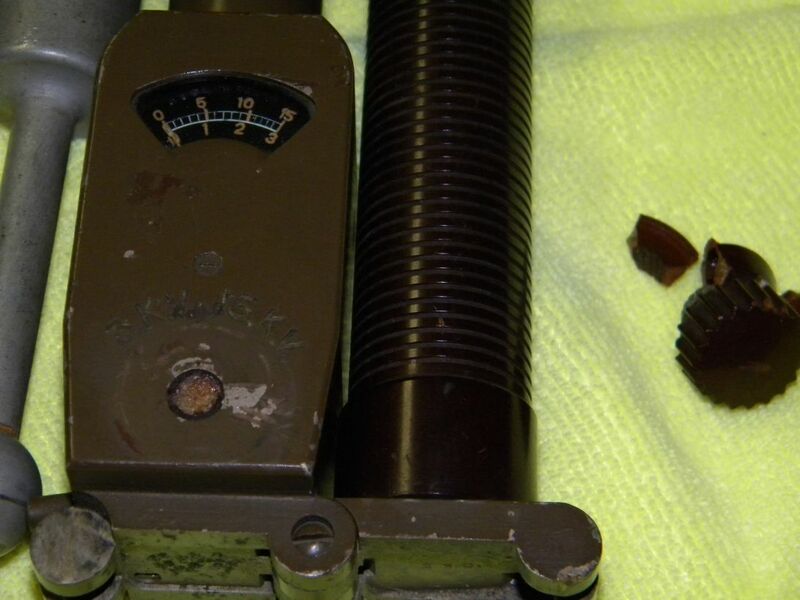 Mystery solved in March 2014 at the Charlotte NC Cryptologic Symposium by David Turner: "I checked around work and found one of the radios that your "mystery drum" goes into. 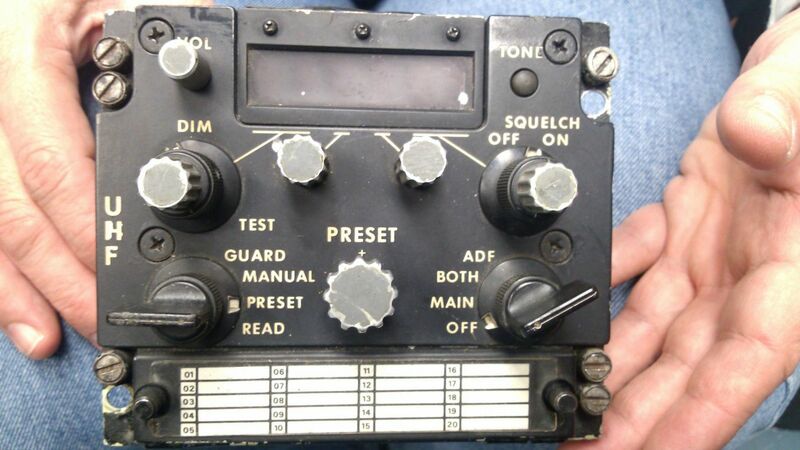 It is an AN/ARC-159 radio. The attached photos show the radio and the drum installed in the radio:"
You can click on any of the two photos above to enlarge for better details. Thank you Mr. Turner for this insight (and much other valuable knowledge during the Charlotte 2014 Symposium!). 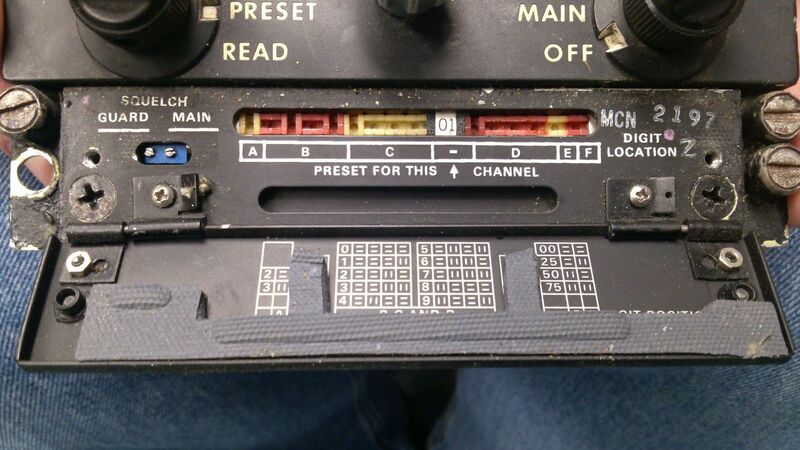 From Mark Blair (NF6X) - "I don't recognize that specific item, but it does remind me of the ID drum in ASR-33 teletypes (a phenolic drum in which protruding tabs could be broken off to define the teletype's ID code), and the channel programming drums in German SEM-25 and US VRC-24/VRC-68 radios (both of which had sliding metal pins to encode the channel memorized in each row). 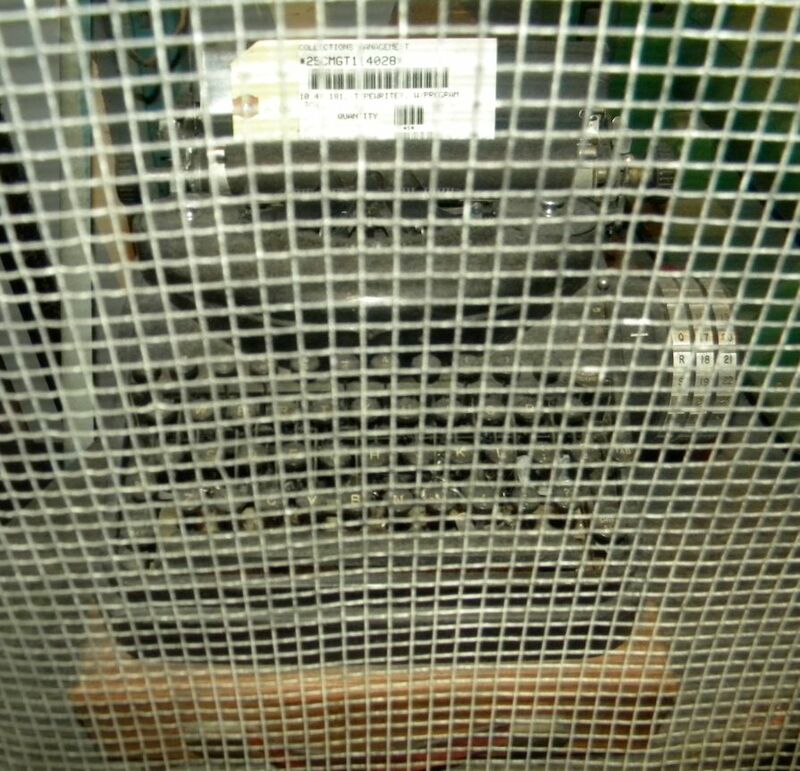 Thus, I'd hazard a guess that your mystery item may either be used for keying such that the rows are read off sequentially once the mechanism is activated, or a memory function in which the drum is rotated to a specific row to read off the configuration encoded there. I tend to favor the latter, as the coloring divides the columns into three 4-bit sections (which could easily be something like BCD encoding of channel numbers) and three 1-bit sections (which could be things like band selection, mode selection, etc.)." From Robert Welsh (William & Mary) - "I once saw a device with a similar cylinder that one could place pins into at the square openings. 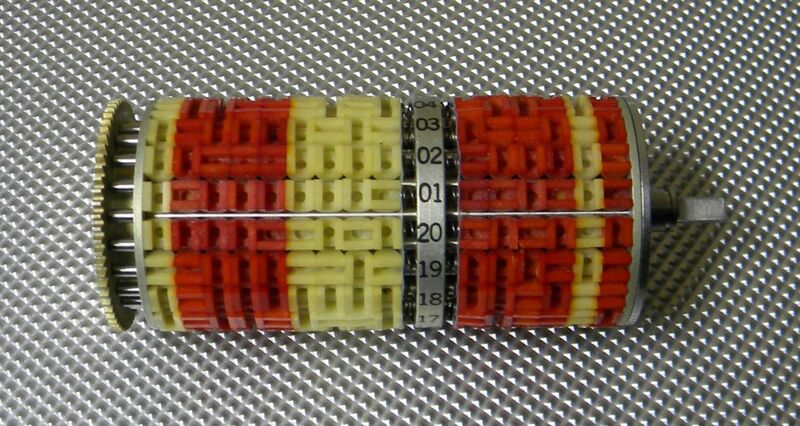 The cylinder rotated either at fixed speed or by a stepping motor, and brushed against micro-switches which enabled a variety of patterns according to how many switches were mounted and what the pin patterns were. Since the pins could be moved about the device was programmable depending on the patterns desired. The recollection could be from my Air Force days but I think it is more recent (since that was almost 60 years ago and your cylinder seems more modern)." Mr. Blair and Mr. Welsh were very close in their assessments above as it turns out! 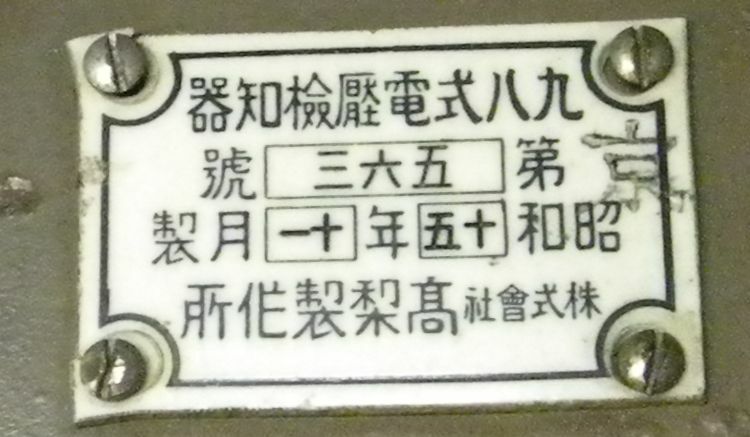 Click for larger photo Source: Personal Collection Unknown Japanese Meter Device - WW2 Vintage. I decided I needed some help, so I went to a Japanese dictionary/discussion web-site, and posed the question about the middle character on the top line. I got some valuable help. Firstly, the responder pointed out that this tag is written right-to-left, and that immediately leads to a correct interpretation of the date, which I had been reading L->R. The device is therefore not dated October 50, but October 15; the device is dated 1940, exactly as you were expecting! Secondly, the responder recognized the character on the top line which I couldn't identify, and was able to give me a modern-Japanese character which means "pressure". "9" "8" "method" "electric" "pressure/intensity" "investigation" "knowledge" "vessel". "electric pressure" would be "voltage", I believe. 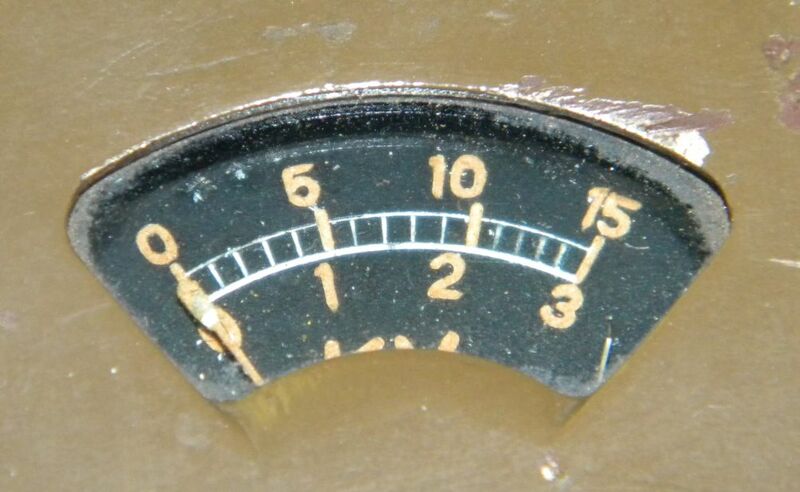 No other significant information on the web has been found on this Japanese WW-2 Metering Device.